The analysis conducted by the Trust DOES NOT determine whether the sample contains asbestos. No representations are being made as to the asbestos content in your sample. Rather, the testing protocol is designed to be a simple, cost effective method to help you meet the evidentiary requirements in the claim form. The ZAI Trust disclaims any liability or risk resulting from the use of the work practices and recommendations discussed in these instructions. It is the claimant's responsibility to ensure that these recommendations comply with all applicable federal and local laws and regulations. If you are a seller in a real estate transaction and have specific knowledge of a material defect or hazardous condition on your property you may have a legal duty under federal or state laws to disclose the condition to prospective home-buyers. The presence of vermiculite may be such a condition. Some states have consumer protection statutes that award significant damages when the failure to disclose was knowing and willful and/or there was an intent to misrepresent or deceive. 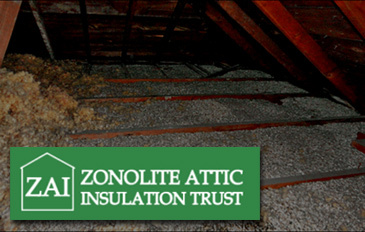 Thus, if you are a homeowner who has intentionally covered up vermiculite attic insulation with fiberglass insulation, cellulose insulation or wood flooring you may be in violation of your states consumer protection statutes if you fail to disclose the presence of vermiculite to potential home-buyers. You should consult with a licensed real estate agent and/or attorney to understand your obligations and to assure compliance with your states laws. Your state may have laws regulating vermiculite as an asbestos containing material (ACM) and/or the disposal of vermiculite insulation as asbestos contaminated waste. You should consult an attorney, other qualified licensed asbestos consultant, or appropriate state agency for advice.